If you’re planning to visit the Dales on your own or with a group there are lots of things you can do to help everyone have a happy and fun day out. Click on the buttons below to reveal more information. The more prepared you are the more successful your day will be. Begin your planning plenty of time before your visit. Think carefully about the group you are taking and their capabilities. Then plan the most suitable route or activity for them. what do people need to wear? what do people need to bring (lunches, drinks)? who else will come with you? When planning your route think carefully about how long you want to be out with the group where you might stop for breaks. In the days before the visit look at the weather forecast www.metoffice.gov.uk, www.mylocalweather.org.uk for where you are going. And remember to follow the countryside code while you are out and about – protect, respect and enjoy! If you can read a map it can help you find your way around the countryside more easily. You’ll need to stick to footpaths but how will you know you’re on the right one? If you’re bringing a group it’s a good idea to think about all the information the group will need to help them have a happy and safe day out. Collect contact numbers from those coming and an emergency contact back home too. Remember that mobile phone reception in the countryside can sometimes be poor. In an emergency ringing 112 will connect you to emergency services even if you have no phone reception. Make sure that someone back home knows where the group are going and roughly what time they can be expected back. If you know you’re going to be late make sure you ring them to let them know. You will need to think about the possible hazards and risks along the way so you are all prepared. Risk assessments can help with your planning. A risk assessment is simply a careful examination of what could cause harm to people so that you can weigh up whether you have taken enough precautions or need to do more to prevent harm. A hazard is anything that may cause harm, the risk is the chance, high or low, that somebody could be harmed by these and other hazards, together with an indication of how serious the harm could be. There is no single correct format for a written risk assessment. Your organisation may have it’s own form or a sample form is attached here It is an essential tool in planning all visits and activities. How: after initial consideration, and before making final arrangements, consider how the activity is to be organised and identify the potential hazards how they will be dealt with. Learning to have regard for the safety and welfare of oneself and others is important. However, there must always be an acceptable framework of safety. Challenge and adventure are never free of risk. Awareness of danger is developed through experience. Leaders need to anticipate the possible risks involved in using particular environments. Risks will be minimised if leaders are familiar with members of their group, their strengths, weaknesses, personalities, and previous experience. Risk assessment is a continuous process and while out the leader will need to continually assess the situation with regard to the group they are with, the location they are in and the local conditions. Sometimes the group may need suggestions on what to wear and what to bring. What to wear? Footwear in particular is really important for helping people to be safe while walking. Walking boots are best as they are sturdy and support the whole foot and ankle, but if you don’t have access to them strong trainers will often do. A waterproof coat is important as the weather can easily change, you may need to borrow spare coats for those who don’t have these. Remind people to bring an extra layer as it can often be a bit colder up in the Yorkshire Dales, particularly if you are going higher up into the hills. If you are going out regularly with groups you can have a stock of coats, jumpers or boots that people could borrow. Leaders you should always carry a first aid kit (and someone in the group should be a first aider), a map and a charged mobile phone. It’s also a good idea to have some spare clothing just in case. Also make sure you have the groups contact and emergency contact details with you. Depending on where you are going you might also want to carry a compass (as long as you know how to use it) and an emergency shelter. This is best carried in a rucksack. You want everyone to enjoy the day so there are some simple things you can do as a leader to help keep the day a happy one for everyone. Make sure you have thought carefully about how long you will be out with your group, particularly once you have looked at the weather forecast www.metoffice.gov.uk. Then think about where you will stop for lunch or other breaks. If it’s windy you might need to find somewhere a bit more sheltered for example. Think too about toilets and what your group will do if there aren’t any on the route. It’s a good idea if you can to have a leader at the front of the group and another at the back, this makes sure that nobody gets left behind! You should always try and walk at the pace of the slowest person in the group, though this can sometimes be difficult. If the group has people who walk at very different speeds the leader should keep an eye on the back of the group, making sure the group doesn’t get too spread out and stopping often to allow people to catch up. These stops can be used to share information about where you are and what you can see so it’s a good idea to try and find information about the area before you go. Or you could have some activities ready for people to do at points along the way. Whilst there will be lots to see during your visit to the Dales here are some ideas for other activities that you might want to have just in case. If your group is keen to do some practical work during their visit you will need to arrange this beforehand. 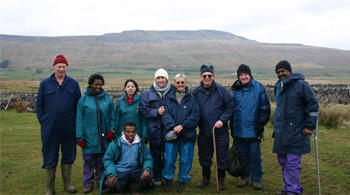 There are a number of organisations that may be able to provide volunteering opportunities in the Yorkshire Dales, have a look at our leaflet for some contacts. It’s a good idea to have one or two easy to do activities with you. See what insects you can find on a minibeast hunt. Sticky cards: Before you go cut some strips of card. Place a strip of double-sided sticky tape across each card. Leave the top plastic backing in place until the card is needed. When you reach a certain spot ask the group to collect ’small treasures’ to stick on their cards – nothing should be bigger than a little fingernail. It can be tiny bits of leaf, petals, seeds, tiny stones or feathers, anything that might remind them of where they have been. This activity works really well if you have to get a group back along a path you have already walked at the end of the day. Please do make sure that the group only picks small things and petals rather than whole flowers. Natural art: Ask the group to create their own natural art or sculptures from what they can find in the area around them. Ask them to choose very carefully and ideally only use objects that they find on the ground. For inspiration you could take some pictures of work by natural artist and sculptor Andy Goldsworthy. Touches: Have a selection of descriptive words (examples below) printed or written onto cards. Each participant is given a descriptive word. They must not show anyone their word. They then use their senses to look for a natural object that matches the word (e.g. smooth – stone). Once everyone has found their object they share it with the group. Others in the group touch, smell and look closely at the object and try to guess the word. Woodland Treasures: Bring some short pieces of wool or thread with you. Stop at a special place on your walk and look around for any fallen natural objects that catch your attention. They might have an interesting shape, colour, texture or pattern. Collect the objects and then bind them together with the thread. Make a loop so that you can attach to a coat button. When you leave the woodland, you will be able to take your memories of that special place with you. You find other great ideas for activities in our Sustainable Schools Leader Pack and even more on the Nature Detectives website here. There are often lots of other activities and guided walks taking place around the Yorkshire Dales that your group can join in with. YDMT also organises the Flowers of the Dales festival each year which has lots of walks, and activities that you could take part in. If a day just isn’t enough you might want to come and stay for a few days! If you and your group want to stay in the Yorkshire Dales there are lots of accommodation options. If you want to take groups out regularly it might be an idea to get some training. People & the DALES can provide training for your organisation or a group of people interested in taking groups out contact us for more information. Here are a few ideas of other courses you could do. If you keep a log of walks you have done then this will help evidence your experience. Lowland Leader Award and Hill and Moorland Leader for those working with groups. Hill and Mountain Skills for those wanting to develop skills at a personal level. Document Template DownloadsClick on the links below to download template files.